Posted by Web Administrator on January 26, 2018 under Community Network in Action. On 25th January 2018, The Albertine Rift Conservation Society has donated ten cows to a Banana Farmers Cooperative (KOAUKI) in Kigarama Sector of Kirehe District, Eastern Rwanda. This donation is under the 12 years Sustainability Agreement (2016-2028) that ARCOS has signed with the cooperative to partner for improved community livelihoods and Environmental Sustainability. “KOAUKI is one of 30 Nature Based Community Enterprises we work with in the region. We strive together to make our partner cooperatives to be the best and inspirational for others. We center our work on four pillars of our BEST Approach, namely, Building Sustainable Institutions, Environmental Resilience, Sustainable business and Transforming and Inspiring others. We are very happy that since our partnership the cooperative has grown in knowledge and income and we are grateful for the financial support from FONERWA and the commendable collaboration from local government”, Said Dr Sam Kanyamibwa, Executive Director of ARCOS network. ARCOS approach for community development and environmental resilience is appreciated by different officials of the local government in Kirehe who commended the work done so far. "We thank ARCOS very much for supporting different cooperatives in Kirehe, particularly the banana farmers’. These cows will help in improving banana farming in the district and you know the latter is an umbrella crop in Kirehe District. We appreciate much your efforts not to work only with cooperatives but go down to individual village members through the Nature Based Community Fund established in Kigarama and Kabungeri Villages to support community investments in improving their livelihoods while ensuring environmental sustainability. On behalf of the Vice- Mayor in Charge of Economic Affairs that I represent today, I thank you and guarantee our continuous support in your community development and environmental resilience initiatives”, said Janvier Nsengimana, Director of Agriculture, Kirehe District. 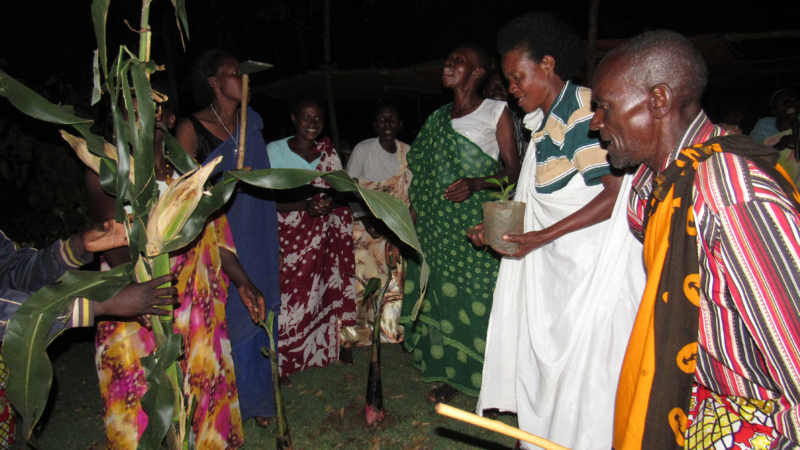 This activity is one of the activities planned under a project termed Using Water-Energy-Food Security Nexus to Promote Climate Resilient Decisions and Model Actions in Selected Landscapes along Akagera Basin. The latter is funded by Rwanda’s Green Fund (FONERWA) and coordinated by ARCOS in collaboration with Stockholm Environment Institute (SEI), Nile Equatorial Lakes Subsidiary Action Programme (NELSAP), the Districts of Bugesera, Kirehe, and Rutsiro, and various stakeholders and sectors involved in water, energy and agriculture in the selected Landscapes along Akagera Basin. The aim of the project is to provide evidence-based policy guidance and promote on-ground model actions that foster climate resilience and participatory sustainable development along the Akagera Basin. The project is being implemented in three landscapes selected in three districts namely Bugesera, Kirehe and Rutsiro. Empower 2,000 rural Rwandan farmers, your donation is worth double today! ARCOS Network in partnership with Bugesera and Rutsiro Districts support local communities to get biogas cooking systems: what does it mean to them?